I can’t stop cooking with all of the delicious fresh food from the farmer’s market. How many different ways to eat corn? 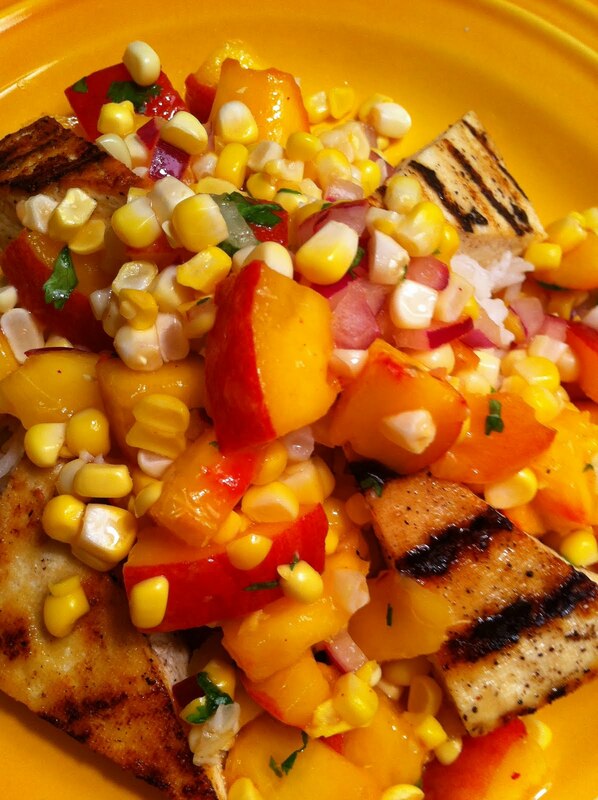 How about this warm corn and peach salsa. Delicious! Drain the tofu and press it while you get everything else ready. Get the rice going. Dice up the peaches, red onion, and cilantro and combine them in a bowl. Squeeze the fresh lime juice over the top and season with salt. Cut the corn kernels off of the cob and saute them in a little avocado oil, until they are nice and bright. Mix in with the rest of the salsa. Cut up the tofu into little triangles. Brush a grill pan with sunflower oil and get it nice and hot. Season the first side of the tofu by squeezing the fresh lime juice over the top and dust with salt and pepper. Place on the hot grill pan with the seasoned side down and sear. When you see grill marks on the first side, squeeze the rest of the fresh lime juice over the top and dust with salt and pepper and flip over. When you see grill marks, the tofu is done. To serve, place the rice on the bottom of the plate and decorate wtih the tofu triangles. Top it off with tons of the salsa. Enjoy!